Another page in the history of the Vermont State Police was written today as the force was expanded with the addition of a pair of four-legged detectives who will perform duties in a highly specialized field of law enforcement. Without the usual fanfare of administering the oath of office as in the case of regular officers, Commissioner of Public Safety William H. Baumann entered on the rolls of the State Police family the names “Major” and “Duchess” of Andover. They are two purebred English bloodhounds recently acquired from the Massachusetts State Police. The new State Police sleuths, who will literally keep their noses to the trail as they carry out their assignments, were brought to the State Police Headquarters in Montpelier from their birthplace at Andover, Massachusetts. Baumann immediately placed them on active duty status, assigning them to the K-9 Barracks, a specially constructed kennel at “Redstone”. While the Vermont State Police have used bloodhounds on numerous occasions, they have always been obtained from a neighboring state, if available, and many times involved a heavy expense to the state as well as long delay in bringing them to the scene. Now for the first time, the state police will have their own dogs to bring immediately into play in cases of lost or missing persons or escapees from state institutions. Long considered necessary in law enforcement this is just another forward step the Department of Public Safety is taking to increase its efficiency. “Major” and “Duchess” and seven brothers and sisters first saw the light of day at the State Police Barracks in Andover, Mass on August 12th, 1953. They are the son and daughter of “Workman of White Isle” , better known as Lieutenant “Sid” and his wife, “’Sadie’ Queen of Andover”, both famous and renowned olfactory hunters of the Massachusetts State Police. “Sid” is a star in his own right and has held the spotlight in many famous cases. The Massachusetts State Police have developed a high regard for his ability as a manhunter. They cite several cases such as a recent roadside restaurant robbery. “Sid” sniffed around the cracked safe for a couple of minutes, then headed for a nearby swamp. In traditional police fashion, “Sid” had the criminal firmly by the britches in just 90 minutes. Sad-faced “Sid” and “Sadie” both have successful records as long as their ears in the business of locating lost or wanted persons. “Major” and “Duchess” come to Vermont with a pedigree nearly as long as their exercising yard at “Redstone”. They are truly “aristocratic bluebloods of houndom” with badges of great ancestral lineage registered with the American Kennel Club. There even seems to be eagerness in the pups to carry on and maintain the enviable reputation held by their ancestors. Trooper Russell A. Goslant has been selected to handle Vermont’s newest additions to the force. He recently completed two weeks of intensive training with bloodhounds at the Andover Barracks of the Massachusetts State Police. This training was given to Goslant by the Massachusetts organization without charge to the Vermont State Police. Goslant, who was graduated from the Vermont State Police Training School with the class of 1952, is a native of Plainfield. After graduation, he was assigned to the White River Substation of Troop “D” of the state police. He was recently transferred to Montpelier in order to train and handle the dogs and he will also be assigned other law enforcement duties. 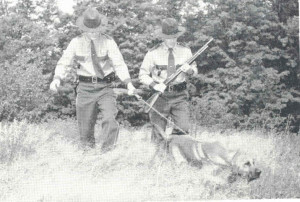 While in training at Andover, Goslant worked with Corporal Ilg and Trooper Murphy who are in charge of the bloodhounds of the Massachusetts State Police. “Major” and “Duchess” have completed their obedience training, and, with Trooper Goslant, will soon commence their trail training. At the conclusion of this training the “canine-dicks” will be ready for actual work. 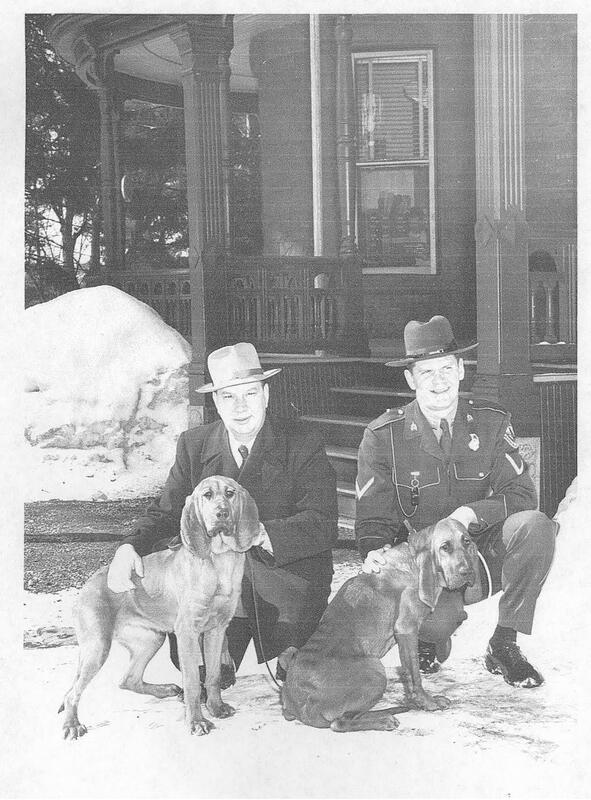 Commissioner Baumann, in commenting on the acquisition of the bloodhounds, stated that Vermont was fortunate in being able to accept the offer of the dogs from the Massachusetts State Police, especially at the nominal price of fifty dollars each. The usual cost of a pair of purebred bloodhounds runs up to fifteen hundred dollars a pair. While the four-legged manhunters will be kept at State Police Headquarters in Montpelier, they can be transported within a short time to any part of the State. Baumann also stated that the dogs will be available without charge to any law enforcement agency that may have a need for them.